Musings of a librarian, baker, and complainer. Sorry, Zooey Deschanel. 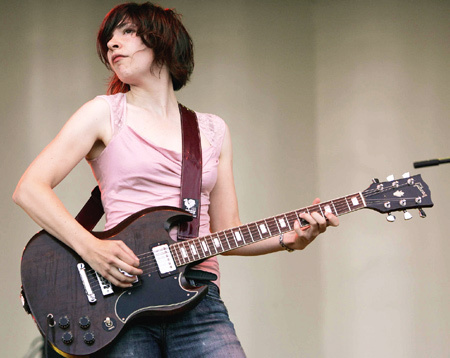 I want to be Carrie Brownstein now. I started watching Portlandia because people who are hip seem to like it, and I want to be hip too. The show is pretty funny about 90% of the time, which is good enough for me. Not only is she funny, but apparently she rocks pretty hard as well. And I like her haircut. If you’re a fan of Top Chef, you were likely as excited as I was to settle in for the premiere of the eighth season, known this time around as Top Chef All-Stars. I was super-psyched for the new season, partly because I like the vast marjority of people that they brought back. For those of you who are unaware, this season showcases a collection of 18 former contestants from previous seasons, all of whom came really close to winning the title but were unsuccessful in the end. This season is unique because I have no “getting to know you” period where I size up each person and make my early prognostications regarding who the winner will be. However, after referring to the list of contestants, I can offer you a list of people who I will be rooting against. 1. Stephen, Season 1. This guy is a nerdy d-bag. He always touted himself as being more of a sommelier than a chef. And you can tell he doesn’t cook much these days, because his first dish stunk. If he doesn’t get it together, he’ll soon get the boot (hopefully). 2. Marcel, Season 2. He’s a good chef, but he stirs the pot, and not in any kind of amusing way. You can’t get away with being that cocky if you don’t have any other redeeming qualities…at least in my book. 3. Jennifer, Season 6. I can’t stand listening to her talk with her weird speech impediment/Philly accent. Is that wrong? I don’t care—I want her gone. 4. Jamie, Season 5. She’s kind of a wildcard, because I actually like her. My problem with her is that all she makes is soup. I think I may keep a tally of how many she makes this season—we’re only one episode in and she already has one under her belt. I don’t care how good they are. MAKE SOMETHING ELSE! You can’t be a one-trick pony if you want to be Top Chef. Besides this group, anyone else can win and I’ll be pretty happy. I was sad to see Elia go last night, but it seemed like she really bungled that fish. Oh well. I have no real predictions about who is going to win. They’re all really good chefs, so it’s just going to come down to who makes better decisions and fewer mistakes. We’ll see! Well, it seems like just yesterday that I was writing about my initial thoughts on the season premier of Top Chef: Season 7, and here we are—a week away from the finale. I am proud to announce that two out of three of my picks for final remaining contestants were accurate (I predicted Angelo, Kenny, and Kevin). Season 5: Carla cracked under the pressure and stupid Hosea swept in. Season 3: Casey cracked under the pressure and Hung swept in. Yes, these examples are going back a ways, and don’t think I would be able to remember the names of all these people unless I checked Wikipedia. I realize that my debate has centered on Ed and Angelo—and perhaps it’s not fair to not give Kevin a sporting chance…but my gut says it’s not going to be him. So, the question remains: does Ed have it in him, or will he follow in the footsteps of the others who have fallen just short of the finish line? I’m starting this blog before the first episode of Top Chef is even over. Right now, it’s 9:51pm and when the show comes back from commercials, the judges will annouce the first person to get the boot. Obviously, it’s either going to be the girl who made the low-fat pâté, or the dude who made the maple dessert. I like to refer to him as Johnny Homeless. Seriously, who makes a dessert on the first challenge? It’s a recipe for disaster (no pun intended—ha ha!). Anyway, let’s go over who will most likely stay for a while and who will be gone within the next few weeks. Mind you, I am confident in my prognostications based almost solely on my Top Chef Intuition, since I’ve only seen most of these people cook one dish so far. Stephen Hopcraft. He introduced himself by saying that he left behind his wife and twin 13 month-old daughters. The people who wind up missing their families halfway through the season never make it, because they lose their concentration and determination. Plus, this guy was one of the bottom four contestants in the first challenge. Tracey Bloom. This was the chick with the bandana and the annoying laugh. I don’t remember what she cooked for the first challenge, but it doesn’t matter. She won’t last, trust me. John Somerville. If this guy didn’t just get kicked off 5 minutes ago (this just in! ), he would’ve gotten kicked off next week. Top Chef does have the occasional weird-looking contestant that makes it for a while, but this guy was just too weird. I still think there’s a good chance he is homeless. Kenny Gilbert. Obviously, most of the Alpha males have already identified themselves, Kenny being one of them. He definitely talks the talk, but I can see him being able to back it up with his cooking skills as well. He seems pretty good. Angelo Sosa. The yin to Kenny’s yang. This guy will definitely be the token annoying guy who will most likely turn into more of a douche as the season progresses—but, he will also most likely make it into the top 3 at the end of the competition. Of course, he had to go and make a dish with foam all over it for the first challenge (a la Marcel from Season 2). I hate foam. Kevin Sbraga. Can’t really get a complete read on this guy just yet—although his Quickfire dish wasn’t great, which didnt bode well for him. However, we have to root for the guy from Jersey. Hamilton, no less! I’ve seen Rat’s restaurant on trips to the Grounds for Sculpture but have never actually been. Regardless, he seems confident enough, which is a good sign. Also, I was thrilled to see that Eric Ripert is going to have a rather large role on the judge’s panel this season. I love that guy and dream of one day going to Le Bernardin. Anywho, based on Episode 1, I’d say this season is shaping up to be pretty good. I didn’t automatically hate anyone, which is a plus, so as long as these people aren’t too boring, things should be pretty enjoyable. It’s great to have a new show on the roster after a month of Lost withdrawal. Well, another season of Top Chef is upon us. I’m hoping for a little improvement over last season, which seemed to be losing some steam by incorporating many lame, product placement-ridden challenges over the course of the show. Although I can’t yet tell if things are on the up and up, here are some things I did notice. 1. Was anyone else distracted by the fact that the vast majority of contestants were full of tattoos? Odd. 2. I predict there will be no ridiculous flings, like the one between Leah and Hosea (another thing I hated about last season), mostly because none of the women are even remotely attractive. There are a few good looking guys, but seriously—male viewers definitely don’t have anyone to oggle. 3. Ashley. I went the entirety of the show not being able to figure out if this person was a man or a woman. I just had to check her bio to see that the pronoun associated with her is, in fact, she. 4. Michael is going to be the token A-hole, who will probably end up making it pretty far, but will not win. He will most likely clash with Jennifer, who people will also dislike but I predict will also make it pretty far. 5. My picks for the top three: Kevin (who I like to call Beardy), Martin, (Already my favorite. Who doesn’t love a cute French guy who wears a little French scarf, or whatever that thing is? ), and I’ll also go with Jennifer because they have to have a girl in there. Although, I think one of the two brothers may also be a wildcard. We shall see! In other news, Inglourious Basterds comes out tomorrow. The question: will it, or will it not, trump Pulp Fiction? Mr. Moviefone (not a real critic, but I always listen to his reviews on Z100’s Elvis Duran & The Morning Show and trust him implicitly) – he’s in! Based on what I’ve read and the degree to which I love Tarantino, if it’s not his best movie, it’s going to at least be in the top three, my top three being Pulp Fiction, Death Proof, and Kill Bill (in that order). Regardless, I’ll be there Friday night. Check back Monday for a full review. Musings of a Fantasy Football loser.